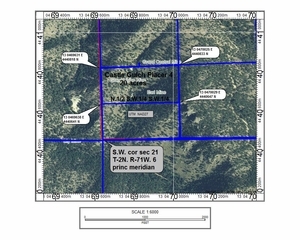 According to Quarterly of the Colorado School of Mines: Gold Placers of Colorado, Book 1 of 2, Dr. Ben H. Parker, Jr., states there is Pyritic Gold and Gold Telluride veins in the vicinity of the Jamestown District among other places in Boulder County. "The sources of the gold of the placer deposits are clear...James Creek head[s] in the mineralized area at Jamestown." Parker also goes on to say that "at Gold Run, James Creek, and Central Gulch, which were not glaciated, concentration of the present deposits began with the end of the canyon cutting." Lovering and Goddard state in Professional Paper 223 from 1950, "Most of the gold in the stream valleys...is extremely fine, as most of the lodes from which it is derived are telluride veins." Copyright ©2003 Wallie Robinson. All Rights Reserved.